In the previous post, we finished our last page, called Purchase Order Items Confirm. 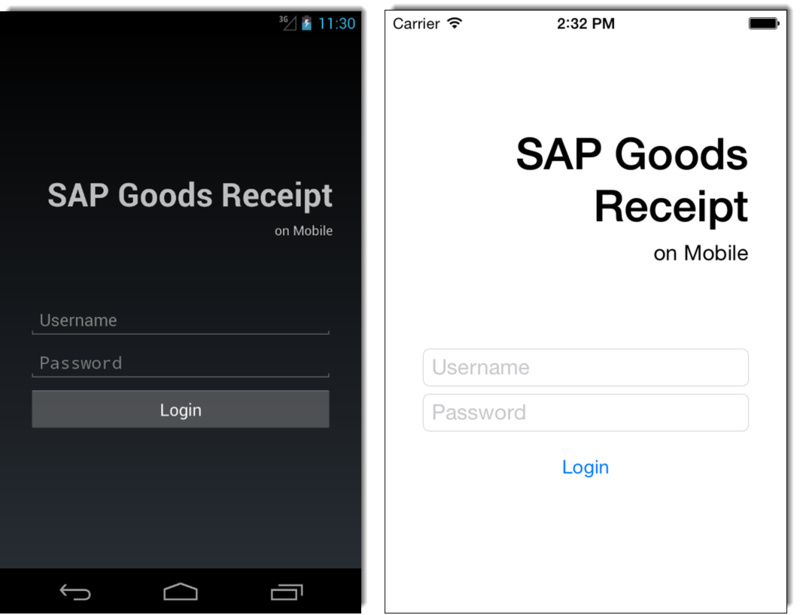 For the next few weeks, the plan is to implement the back-end features one-by-one, and in parallel we will link these features under our existing mobile app, SAP Goods Receipt. 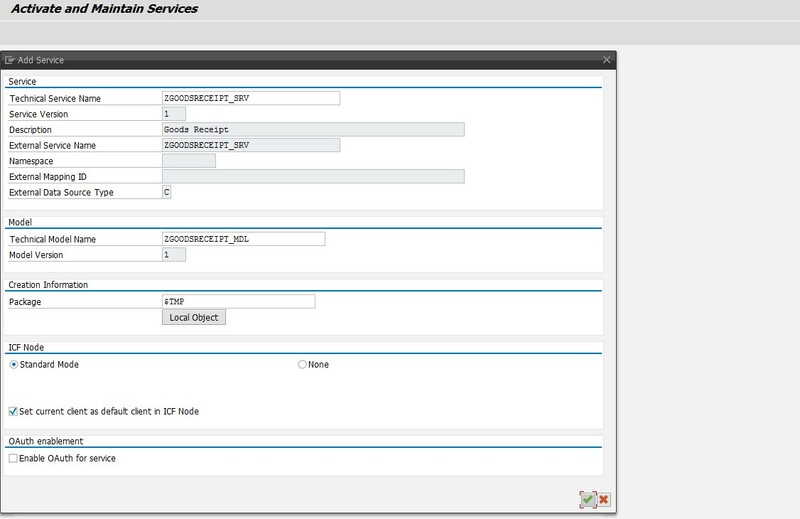 Today, I'm going to demonstrate you, how easy is to create a simple OData service within SAP Netweaver Gateway. Ready to go? Our first task is to create a new project in the transaction, SEGW by clicking on the highlighted button. In the popup window, we are going to set a unique Project ID, a Description, and if you don't have any specific requirements, you can leave the rest of the properties as it was by default. At last, we need to assign it to a Package, or mark it as a Local Object. In the next step, we are going to generate the project, namely generate the different helper classes, such as Model Provider Class, or Data Provider Class. In the popup window, the system fills the different class names out automatically, so our task is only to approve them. In the next step, we are going to register our newly created service. In order to do this, first let's select a system (in my case the SAP ECC and SAP Netweaver Gateway is installed together, but it can differ in your case). For the case, if you don't have any entry in the list, you can find the relevant settings under the following path: SPRO -> SAP NetWeaver -> Gateway Service Enablement -> Backend OData Channel -> Connection Settings to SAP NetWeaver Gateway -> SAP NetWeaver Gateway Setting. At last, push the button, Register in order to register our service. In the popup window, the system gives us a prefilled screen again, so we only need to assign a Package, or mark our service as a Local Object, and approve the settings. If everything went fine, you should see the same green traffic light. Now our service is active and running, so there is nothing left, then Test it! In order to test it in the simplest way, let's click on the button, Maintain. 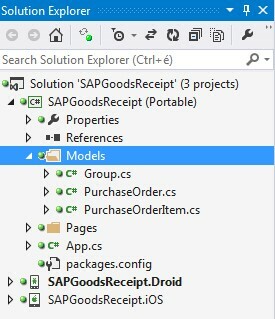 If you have more than one service, then let's select the one with the technical name, ZGOODSRECEIPT_SRV. At the bottom side of the window, we can find the different testing tools: we can test it in simple browser or using the built-in Gateway Client (that is actually an OData client). For the sake of the simplicity, let's push the button, Call Browser that opens a browser up for us with the appropriate service URL. Our service is up and running. It doesn't do anything, but from now on, we can simply use it to authenticate into our system. 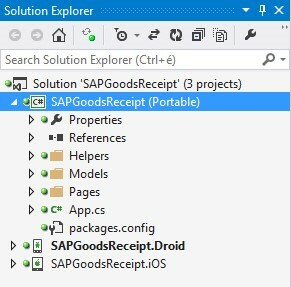 Next, we are going to move back to our Xamarin mobile app, and try to call this service using the URL (http://xxxx.xxxx.com/sap/opu/odata/sap/ZGOODSRECEIPT_SRV/), to login into our system. I hope, you could follow me, and everything went fine. If not, then don't hesitate to leave me a comment below! Stay tuned, keep reading! If you want to get notification about the newest posts, follow us or subscribe to our newsletter! If you liked it, please share it! Thanks! 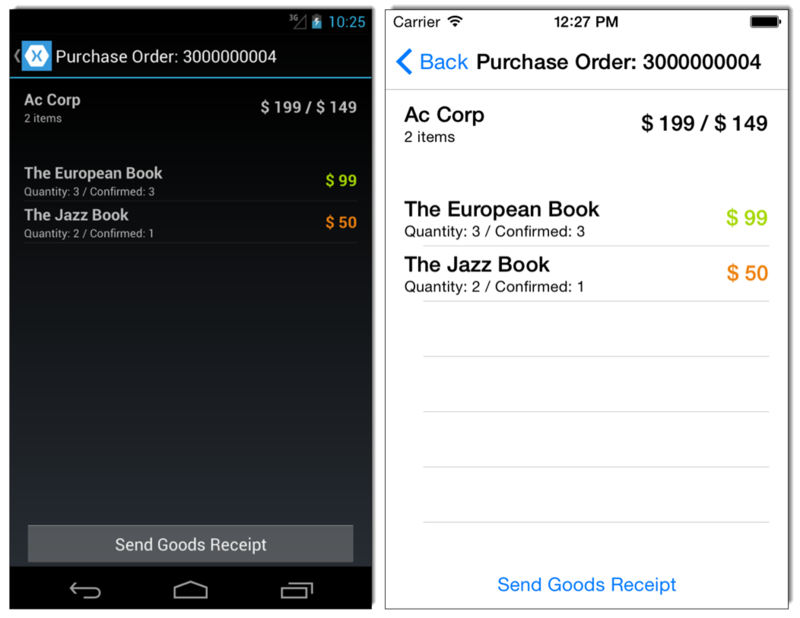 In the previous post, we finished the third page of our app, the Purchase Order Items page. In this post, we are going to continue our project, and start implementing our last page, called Purchase Order Items Confirm in the same way as before. The workflow is going to be very similar to the previous ones: we create a new page, build its structure in XAML, and implement its code behind as well. Ready to go? Then, let's get started! First of all, let's create a new page for showing a confirmation page for an item of a Purchase Order, by right clicking on the folder, Pages >> Add >> New Item. Here let's choose the template Visual C# >> Code >> Forms Xaml Page, and name it as PurchaseOrderItemsConfirmPage. This goes similar to the previous pages, namely we define a main StackLayout for holding the content of the complete page, and add a 15dip left&right padding, to ensure the content of our page doesn't climb down from the screen. Then, we divide the page into three different sections: Purchase Order Item Header, Quantity to confirm, and a last one section for the Save Item button. Now, we are going to build the Header section first, using two another sub StackLayouts: one for the Item Name and the Quantity Confirmation Ratio, and another for the Confirmed Price that we aligned to the end (right side). For the Item Name and the Quantity Confirmation Ratio, we use almost the same label definitions as in the Purchase Order Items page. Into the next sub StackLayout, we place a Label for holding the Confirmed Price. That's it! That was the Header section, now we can go ahead and talk about the next one. In the Quantity to confirm section, we place a simple Label to display the text: "Quantity to Confirm" that we aligned to center, and under it an Entry for the user input. The last section is about the Save Item button, so simply let's place a button into it! 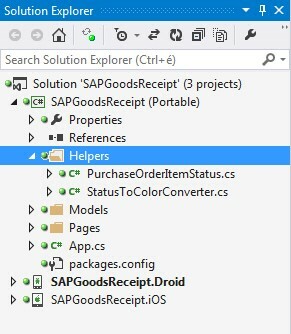 Now, it's time to go back to our previous page, named Purchase Order Items, and set the event, ItemTapped in the XAML to handle user interactions on the Purchase Order Items listview. We are going to handle it in the method, OnPurchaseOrderItemSelected(). In the event handler, first we simply clear the selections (without it the tapped item stays selected). 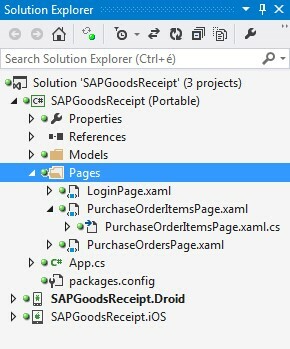 Then with the help of Navigation.PushAsync(), we navigate to our newly created page, PurchaseOrderItemsConfirmPage, and send two parameters via its constructor: the Purchase Order, and the Purchase Order Item. 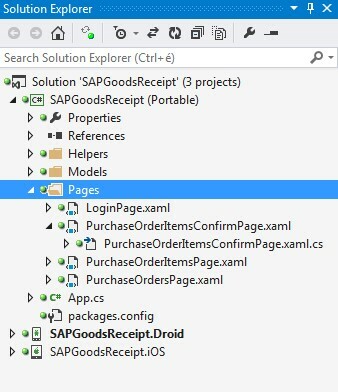 As we defined our new page in XAML, and set the navigation from the Purchase Order Items Page to this page, it's time to implement the code-behind as well. First of all, we need two fields to store the received constructor parameters (remember, we send two parameters in the event handling method). In the constructor, after the initialization, we simply save the received parameters into our read-only fields. Then, reusing the received information, we construct the Title with the following format: "Purchase Order Item: 3000000003 / 10". 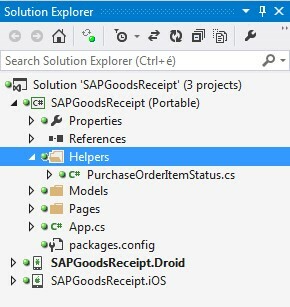 Next, we take care of the header bindings (Item name, Quantity Confirmation Ratio, and Confirmed Price) that we extract to a helper method, HeaderBinding(). Remember, we defined a button in XAML that we want to use later on to save the entered quantity. To implement its click event, now, we simply display a simple message, and navigate back to the list of Purchase Order Items (note: it will be reimplemented later). 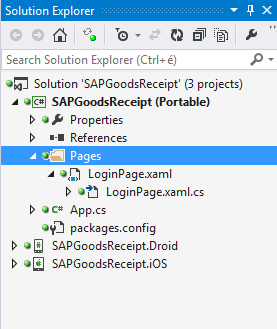 In the extract method, HeaderBinding() we simply assign the Purchase Order Item info to the different labels. It was a long story again, sorry for that! But don't forget: Hard work pays off! Now, we have a running app with four pages with a nice navigation among them! I hope, you could follow me, and everything went fine. If not, then don't hesitate to leave me a comment below! 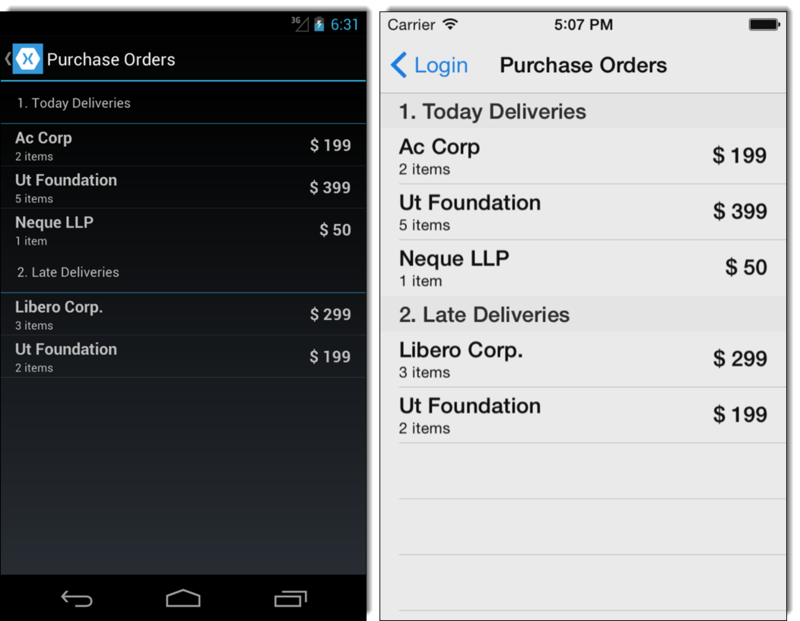 In the previous post, we finished the second page of our app, the Purchase Orders page. In this post, we are going to continue our project, and start implementing the next page, called Purchase Order Items in the same way as before. It's going to be a bit more complex, than the previous two pages, since the page contains a header, a listview, and a button at the bottom of the page that requires a bit more work! Since we are working on the Purchase Order Item page, we need a model as well. 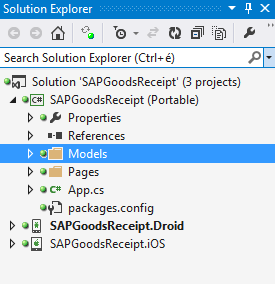 For this, let's create a model, named PurchaseOrderItem, by right clicking on the folder, Models >> Add >> New Item. Here let's choose the template Visual C# >> Code >> Class. For a Purchase Order Item, we are going to store the following info: Id, Name, Confirmed Price, Quantity Confirmation Ratio, and a Status. Since, the Purchase Order Items belong to the Purchase Orders, we need to link them together like this: we are going to store a collection of Purchase Order Items for each Purchase Order. Then we add an additional property, named Total Price Confirmation Ratio. In the model, Purchase Order Item we referred to a type, named PurchaseOrderItemStatus that actually is an enum. To keep our projects transparent, we are going to create a new folder for our helper classes. For this, let's create a new folder, named Helpers under our PCL project, by right clicking on the project >> Add >> New Folder, where we are going to place the different helper classes of our app. Now, let's create the enum, named PurchaseOrderItemStatus, by right clicking on the folder, Helpers >> Add >> New Item. Here let's choose the template Visual C# >> Code >> Class. Within the class, let's implement an enum with the followings: New, InComplete, and Complete. Now, we are going to create a new page for showing the items of a Purchase Order, by right clicking on the folder, Pages >> Add >> New Item. Here let's choose the template Visual C# >> Code >> Forms Xaml Page, and name it as PurchaseOrderItemsPage. This goes similar to the previous page, like we define a main StackLayout for holding the content of the complete page, and add a 15dip left&right padding, to ensure the content of our page doesn't climb down from the screen. Why we place the main StackLayout within ContentPage.Content? I will answer it later! Then, we divide the page into three different sections: Purchase Order Header, Purchase Order Items, and a last one section for the Send Goods Receipt button. Now, we are going to build the Header section first, using two another sub StackLayouts: one for the Vendor Name and the Number of Items, and another for the Ratio of the Confirmed Total Price that we aligned to the end (right side). For the Vendor Name and the Number of Items, we use the exact same label definitions as in the Purchase Orders page. The story is the same for the next one, but now instead of the Total Price, we are going to show the Ratio of the Confirmed Total Price. The next section is about the List of Purchase Order Items that actually is ListView and we are going to define its ViewCell again, in the exact same way as we did in the case of the Purchase Orders listview. The ViewCell definition starts with a simple StackLayout. Then, we divide it into two section: a "left" and a "right" part. On the left hand side, we place a Label for the Name of an Item, and display the Ratio of the Confirmed Quantity. On the right hand side, we place a single Label for showing the Confirmed Price for the given Purchase Order Item. 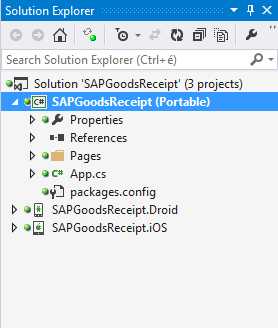 In the last section, we only define a simple button, named Send Goods Receipt that we are going to use later on. otherwise, the color is going to be the default color. In XAML, to define the color of an object in this way, we need an IValueConverter implementation, let's say a StatusToColorConverter that is responsible to take a Status, and return a Color back. For this, let's create a new helper class, named StatusToColorConverter, by right clicking on the folder, Helpers >> Add >> New Item. Here let's choose the template Visual C# >> Code >> Class. The implementation of the StatusToColorConverter is very simple. Now, we only need to implement the method, Convert(), so we won't deal with the method, ConvertBack(), just return a null back. Within the Convert() method, we are going to construct a simple branch based on the received value (that is actually a PurchaseOrderItemStatus), and return a color back. Now, it's time to jump back into the XAML definition. To use our newly created converter class, first we need to set its namespace and assembly. Then we need to build a simple ResourceDictionary, where we refer to it with the key colorConventer. That's why, we used ContentPage.Content when we defined the layout of the page, because I knew that we are going to build a resource dictionary as well (ContentPage.Resources). From now on, we can use it to define the color of our Confirmed Price label. So we bind the the ConfirmedPrice property to the Label's text, and the Status property to the Label's text color. For this, we need to open up the XAML for PurchaseOrdersPage, and add a single line of code: ItemTapped = "OnPurchaseOrderSelected". Now, there is nothing left, than implementing the method that we referred to in the XAML file, OnPurchaseOrderSelected(). 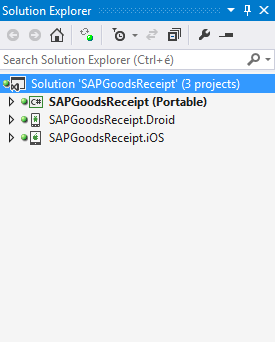 When we tap on one of the item in the listview, the system will call this method. Our first task is to remove the row selection (otherwise the selected row will remain highlighted, when we navigate back to the list). Then we need to perform a simple navigation to our Purchase Order Items page, as initializing a new PurchaseOrderItemsPage with sending the selected Purchase Order as a parameter that then we add to the top of the navigation stack, using the Navigation.PushAsync() method. Now, as we are ready the navigation from the PurchaseOrdersPage to the PurchaseOrderItemsPage, we should catch somehow the received selected Purchase Order, and display its content on the page. Then using the received Purchase Order, we feed the Title (simply display the PurchaseOrder.Id), the Header, and the Listview with data. In the Header section, we display the Name of the Vendor, the Number of Items, and at last the ratio for the Confirmed Total Price that we both get from the selected Purchase Order. In the ListView, we simply bind the list of Items for the selected Purchase Order to our PurchaseOrderItemsListView. Finally, we arrived to the last part of our task today, namely we need to provide some sample data to our app (we need items for our Purchase Orders). 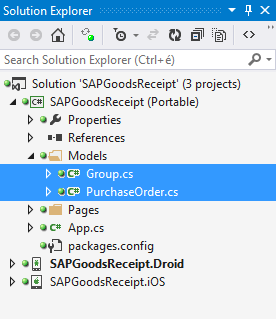 We need to extend our existing method, GetPurchaseOrders(). It was a long story again, sorry for that! Hard work pays off! Now, we have a running app with three pages with a nice navigation among them! I hope, you could follow me, and everything went fine. If not, then don't hesitate to leave me a comment below! Next, we are going to work on the Confirm Item page. In the previous post, we finished the first page of our app, the Login page. In this post, we are going to continue our project, and start implementing the next page, called Purchase Orders in the same way as before. It's going to be a bit more complex, than the Login page, since the page contains a grouped list, and requires a bit more work! First of all, we are going to create a new page for the list of Purchase Orders , by right clicking on the folder, Pages >> Add >> New Item. Here let's choose the template Visual C# >> Code >> Forms Xaml Page, and name it as PurchaseOrdersPage. In the previous post, we defined a single-paged application (with our LoginPage), but now we have 2 different pages, and we would like to navigate back-and-forth between them. For this reason, we are going to redefine the root page of our app (file App.cs), like this: instead of assigning the LoginPage itself to the MainPage of our app, let's instantiate a NavigationPage, with specifying the LoginPage as the initial page. As a result, our apps still start with the Login page, but from now on, we are able to navigate back-and-forth among the different pages as well. So now, we can navigate between our pages, but using the class, NavigationPage has a side-effect, namely it places a navigation bar at the top of our pages as well, that we want to avoid on the login page, since we don't need navigation bar on this page. For this, there is nothing to do, than setting the property of the NavigationPage class, named HasNavigationBar to false within the file, LoginPage.xaml.cs. After wrapping our LoginPage into a NavigationPage, we are a step away from navigating among our pages. In order to navigate from the Login page to our new Purchase Orders page using the button, Login we have to catch the Clicked event of our button. But how to refer to it? Button1, Button3, ButtonLogin, ...? Now, we can easily refer to our button and its events, and specify an event handler with a simple lambda expression. Within the lambda expression, now we are going to simply navigate to our new PurchaseOrdersPage. Later on, we will perform an authentication here before navigating to the next page (of course in case of success only). If you are ready, then we can go ahead and make some preparation for the Purchase Orders list. To keep our projects transparent, we are going to create a new folder for the models. For this, let's create a new folder, named Models under our PCL project (by right clicking on the project >> Add >> New Folder), where we are going to place the different models of our app. We are going to create two models, one for defining a single Purchase Order entity, and another for representing a group with a key and the list of its related items. For this, let's create two models, named Group and PurchaseOrder, by right clicking on the folder, Models >> Add >> New Item. Here let's choose the template Visual C# >> Code >> Class. The Purchase Order model is going to be very simple, with a few properties, like Id, Vendor, GroupType, NumberOfItems, TotalPrice (note: we are going to extend it if it's appropriate). 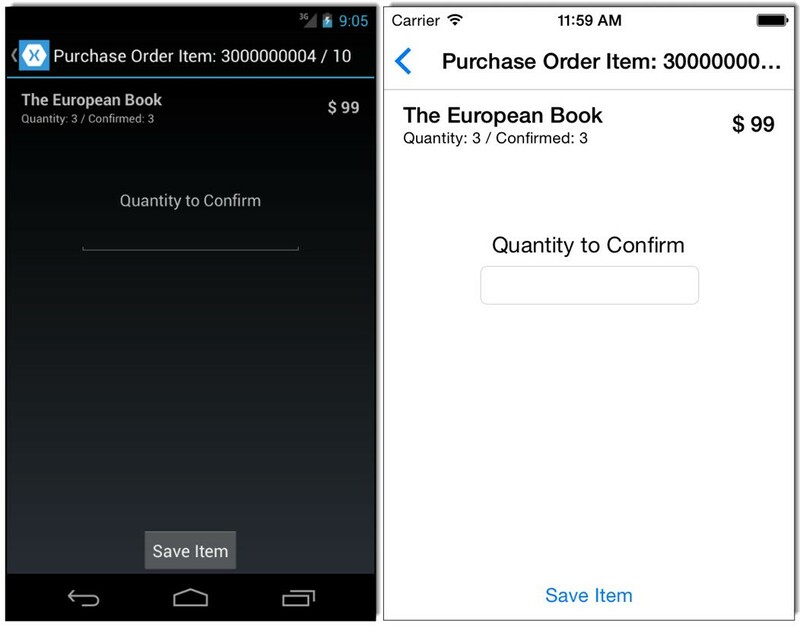 The grouped listview approach in Xamarin.Forms originates from James Montemagno. The part of the solution is to create a complex model that we use for storing each K key with the associated list of T items. 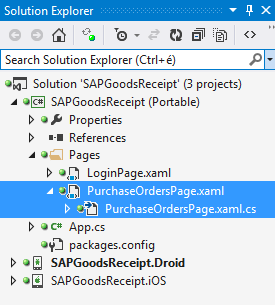 Alright, now we have everything to build our Purchase Orders page directly in XAML. and at last, we set the binding for text of the group headers that is going to be the Group.Key property ("1. Today Deliveries", "2. Late Deliveries"). We start the cell definition with a horizontal main Stacklayout that we place 15dip away from the left and right sides of the screen (to ensure the content won't slip off the screen). Within the main StackLayout, we place two sub StackLayout centered vertically, the first will hold the Vendor and the Number of items, and the second one will hold the Total price that is aligned to the end (or with other words, to the right side). Then, we place another Label into the second sub StackLayout for displaying the Total price, where apply the same binding method (we map the content of the label to the PurchaseOrder.TotalPrice property). Now, we arrived to the last step, namely feeding the grouped listview with data that we are going to implement, in the code-behind file, PurchaseOrdersPage.xaml.cs. To feed a listview, we need to use its ItemsSource property. Now, we simply delegate the work of collecting the required data to a method, named GetGroupedPurchaseOrders. Later on, we will extract this logic into a PurchaseOrder repository, since collecting the required data, it's not the view's responsibility. and at last, we create a collection of the groups. As you can see, now we use an ObservableCollection instead of a simple List, since the ObservableCollection is data collection that provides notifications when items get added, removed, or when the whole list is refreshed, so we don't need to deal with refreshing the UI, when the collection changes. To feed the listview with sample data, now let me simply create some sample records only in the memory. It was a long story, but now we have a running app with two pages! I hope, you could follow me, and everything went fine. If not, then don't hesitate to leave me a comment below! Next, we are going to work on the Purchase Order Items page.